Spring is here. In LA, this past week was actually so hot and it was like a summer. In any case, my spirit is feeling spring, so I decided to make a rice dish with Sakura no Shio-zuke (salt-pickled cherry blossom flowers). 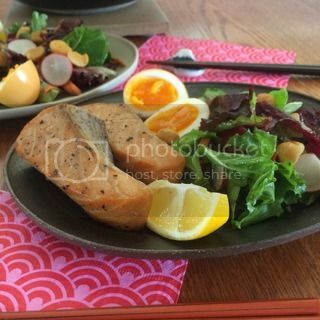 It's not very easy to find salt-pickled cherry blossom flowers in the US, but you can order online from some specialty shops (both imported and domestic made), or you can also make your own salt-pickled cherry blossom flowers if you can get the flowers. 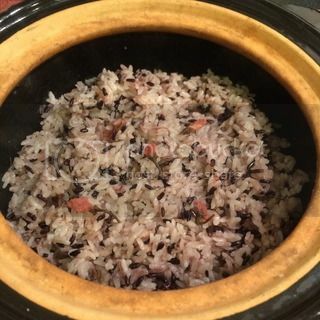 Once you have the salt-pickled cherry blossom flowers, it's so easy to make cherry blossom rice with double-lid donabe rice cooker, "Kamado-san"! Addition of black rice (sometimes called "forbidden rice") made the finished rice become slightly pink and look really pretty with the cherry blossom flowers. The rice has the beautiful floral aroma from the cherry blossoms. The rice is great on it's own or with something else on the side to make it a complete meal. 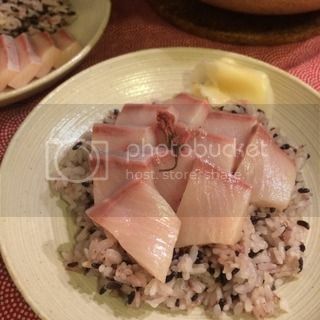 I like to serve with hamachi (yellowtail) sashimi. 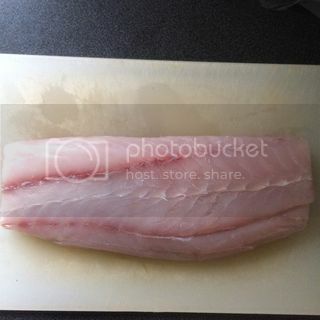 Tai (sea bream/ also called tai snapper) sashimi is also nice, too. Soak the pickled cherry blossom flowers in cold water in a bowl for 5 minutes. Drain and gently rinse. Pat dry. Reserve a few pieces for garnish, and mince the remaining (including the stems). In “Kamado-san”, soak the rinsed rice (all kinds) with the water and sake. Soak for 20 minutes. Add the minced cherry blossom flowers. Place both lids of “Kamado-san” so that the holes of the lids are positioned perpendicular to each other. Set “Kamado-san” over medium-high heat and cook for 13-15 minutes, or until 2 minutes after the steam starts puffing out of the top lid. Remove both lids of "Kamado-san", and gently fluff with a rice paddle. Garnish with the reserved cherry blossom flowers. To serve, plate in serving bowls and serve with some yellowtail slices and gari shoga on the side. Lightly dip the fish in soy sauce in a saucer with a dab of wasabi on the side, if you like. On one sunny Sunday, we didn't have any special plans, so I wanted to just relax at home and take a walk to the park in the afternoon. It was a perfect kind of day for a quick donabe smoked dish for lunch. 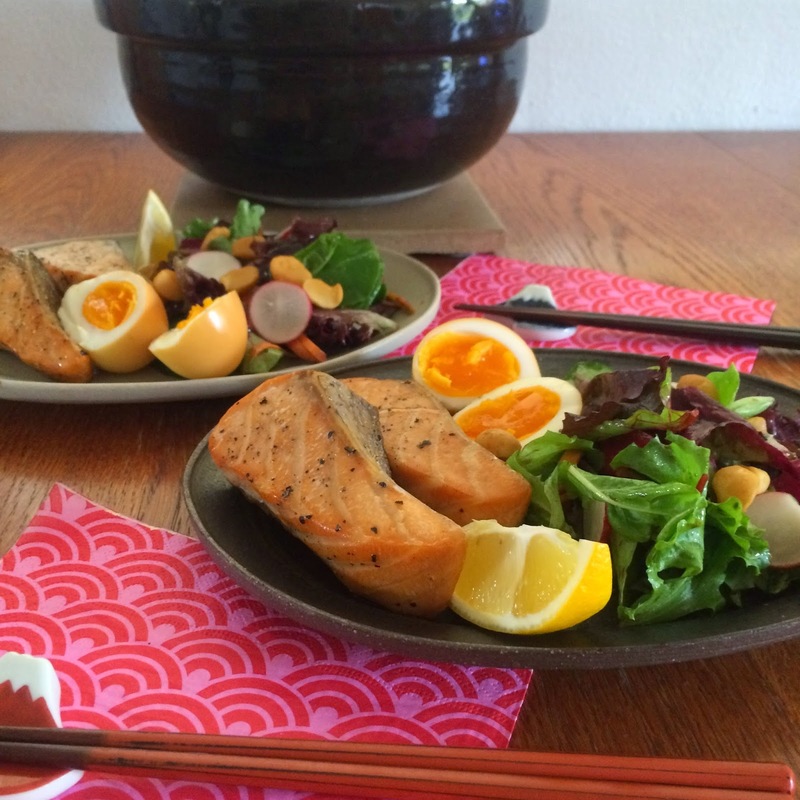 I made quick smoke of salmon, boiled eggs, and macadamia nuts with my donabe smoker, "Ibushi Gin", and made a salad dish. It was so delightful! Season both sides of the salmon filets with salt and pepper. Set aside for 30 minutes. Pat-dry. Line the bottom of "Ibushi Gin" with a piece of aluminum foil. Spread the smoke chips so that they make a ring shape. Make sure the foil is tightly attached to the bottom. Arrange the salmon pieces on the bottom and middle grates. 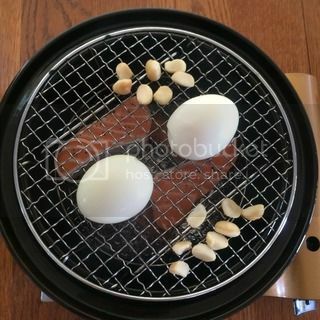 Set the top grate and arrange the boiled eggs (pat-dry first) and macadamia nuts. Set "Ibushi Gin" over high heat. Once the chips start smoking (about 7-8 minutes), cover with lid and fill the rim with water. Continue to heat for 5 minutes. Turn off the heat and let "Ibushi Gin" stand for 20 minutes (with lid on). Serve with lemon wedges with tossed green salad (optional). 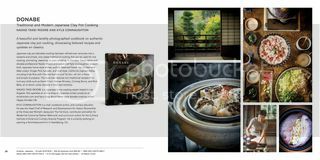 Here's the very early sneak-peak of our upcoming DONABE Cookbook, from Fall 2015 release catalogue from our publisher, Ten Speed Press. We are finally on the designing stage right now and it's already looking really good! The books co-authored with Chef Kyle Connaughton (upcoming Single Thread Farms) and photographed by Eric Wolfinger. DONABE Cookbook is scheduled to publish in October 2015! To see the enlarged catalogue page, click here for the link to the PDF version. 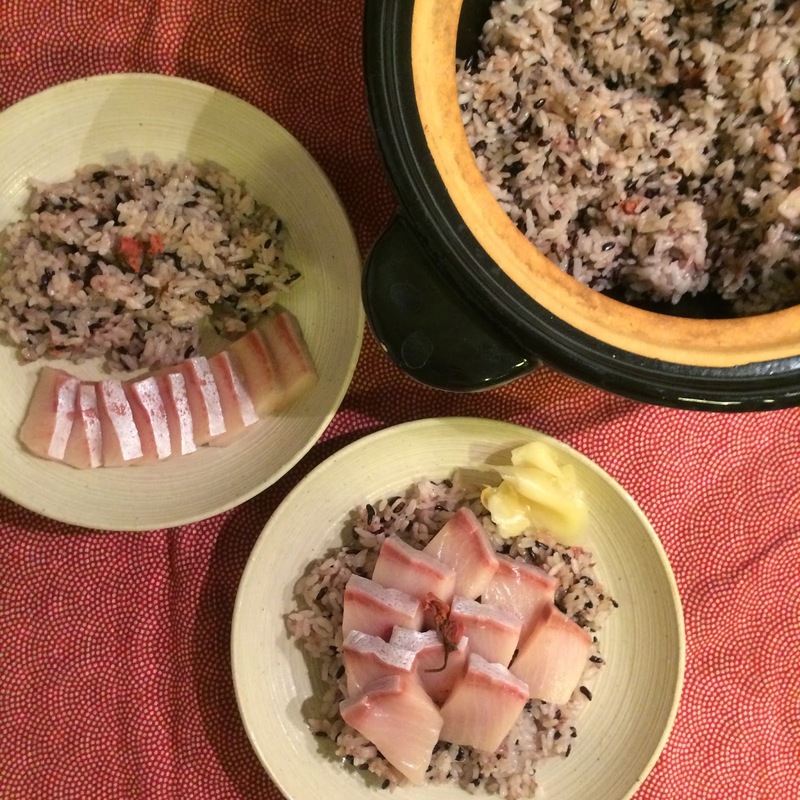 Here's another version of Ikura rice, with double-lid donabe rice cooker, "Kamado-san". This time, I made sushi rice and topped with smoked salmon and ikura. It's so easy! Here's the recipe. In “Kamado-san”, soak the rinsed rice with the water and sake and put the dry kelp on top of the rice. Soak for 20 minutes. 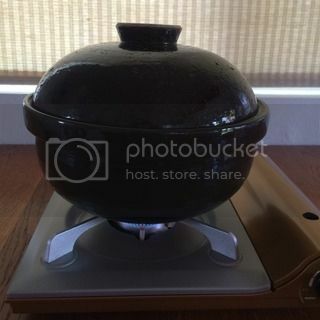 Place both lids of “Kamado-san” so that the holes of the lids are positioned perpendicular to each other. 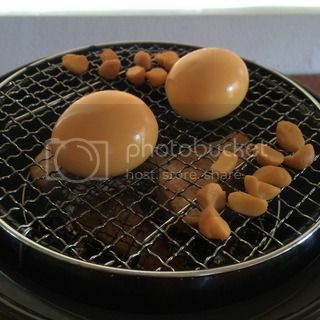 Remove both lids of "Kamado-san". Remove the kelp and quickly add the “sushi-zu” to the rice and fluff with a rice paddle. To decorate, spread the micro greens (save a few pieces for garnish) over the rice, followed by the smoked salmon and ikura. Garnish with a few sprigs of remaining micro greens. Serve immediately with lemon wedges and some wasabi paste. 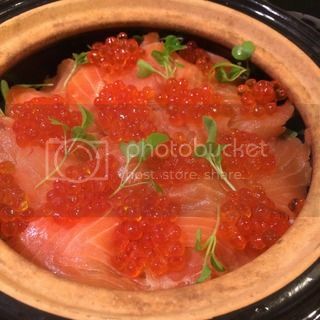 Ikura (salmon roe, or often called as "salmon caviar" in English) is regularly sold all year round at Japanese markets or specialty stores in the US. The already seasoned kind is convenient to use as a topping for your appetizer or rice. Yes, it tastes fantastic over freshly-made rice in double-lid donabe rice cooker, "Kamado-san"! This is a very simple ikura rice dish and tastes fantastic. 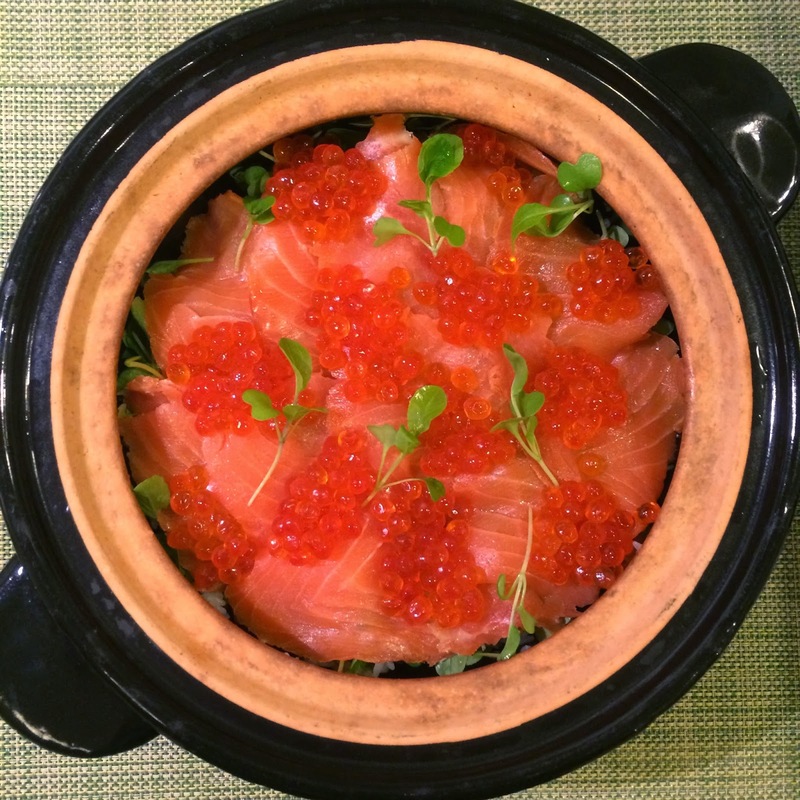 You make plain rice with Kamado-san, and top with some roasted nori seaweed (break by hand first), chopped mitsuba (Japanese parsley) or your choice of aromatic herbs, ikura (salmon roe), and chopped yuzu (or meyer lemon) rind. That's it! Serve immediately with a little soy sauce, if you like.